Bresimar Automação already has new M8x1 I/Os splitters with integrated logic functions from Escha. These very compact modules enable intelligence close to the manufacturing floor, even on field sensors, transporting pre-processed signals to a central control unit. To facilitate a secure connection between passive I/Os splitters and control units, multi-pole cables are required. In the case of active field distributors, shielded cables are required. In contrast, I/Os breakers with logic functions from Escha offer the advantage of using ordinary 4 or 5 pole, unshielded sensor cables that can also be installed much more flexibly than a comparable rigid cable. In this way, costs and time of connection and labor are significantly reduced, avoiding connection errors by the customer or installer. 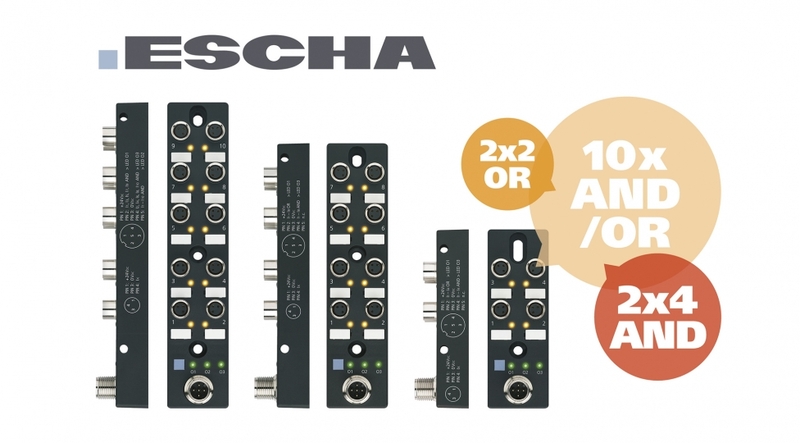 Due to its very robust and compact style, the new Escha M8x1 I/O splitters with integrated logic functions are specially adapted for applications with reduced space conditions, such as tools for robotic manipulators, robots or automatic manipulating devices. The dispensers can be installed in a wide variety of mounting positions through the various fixing holes. Your ID tags on all your I/O connections make it easy to dial and allocate. These new I/O splitters are available in 4-way, 8-way and 10-way versions, with various combinations of integrated logic, AND and OR functions. Dispensers do not need to be programmed by a technician due to an existing predefined logic and therefore can be immediately installed and put into service. A channel switching status LED display and an LED display for the logic output provide an overview of the key functions. All distributors include IP65 and IP67 protections. Para mais informações, contacte por favor o nosso ou o nosso . For further information, please contact our sales department or our Escha brand manager.